Another sunrise I was awake for, only this time it was as I was leaving home. Much nicer than being at work for it. In Faux Fuchsia style, some of the frangipanis in my mum's front garden. Everything has grown so much since I saw it at Christmas. Guess they have had a lot of rain. 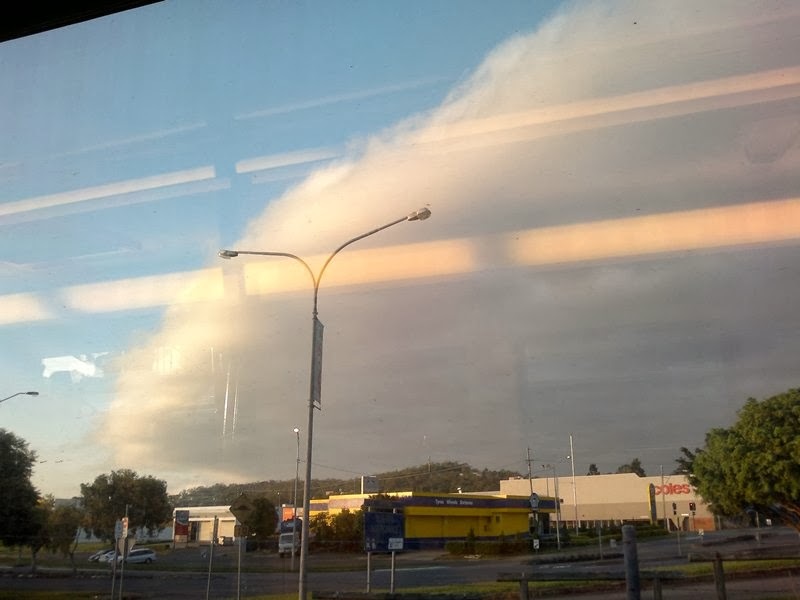 The edge of the cloud that was hanging over Brisbane. This photo is taken on the train, could see it from the house but it was definitely nicer weather down the coast this morning! 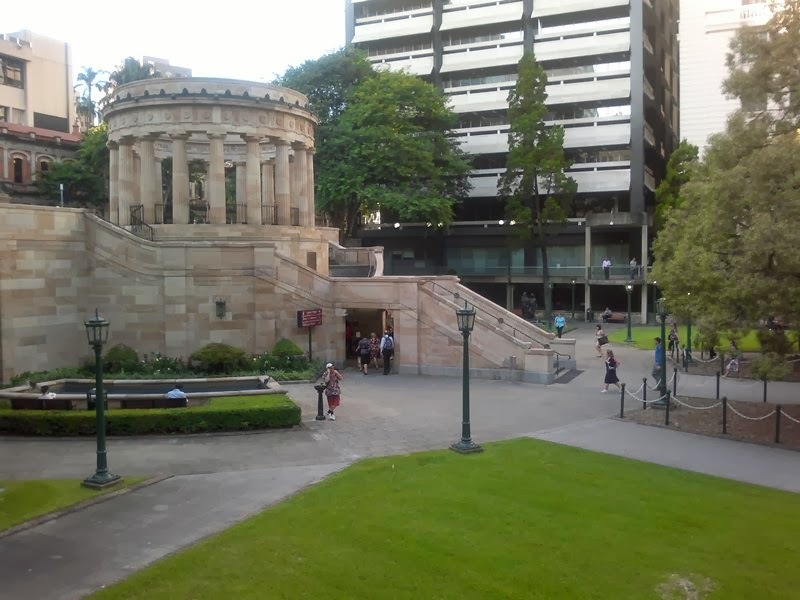 The 'Train Station March' at the end of the day. 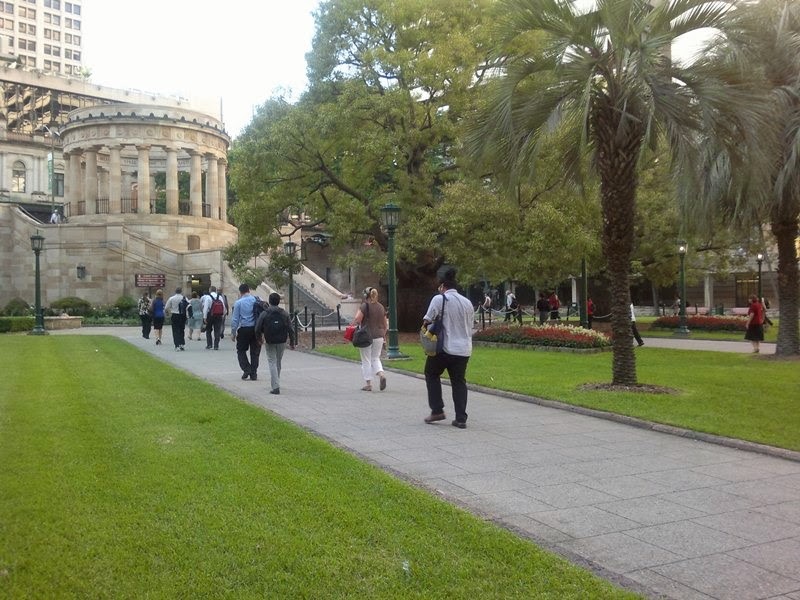 All marching to a doorway under the eternal flame (this is Anzac Square by the way). Reminds me of the Pied Piper of Hamelin. All disappearing into the cave...it's actually a subway to Central Station. And finally, today's purchases. I was such a good girl, finished work early and went to the hospital again. MsA (my friend) was a bit tired, so I stayed until she wanted to sleep. 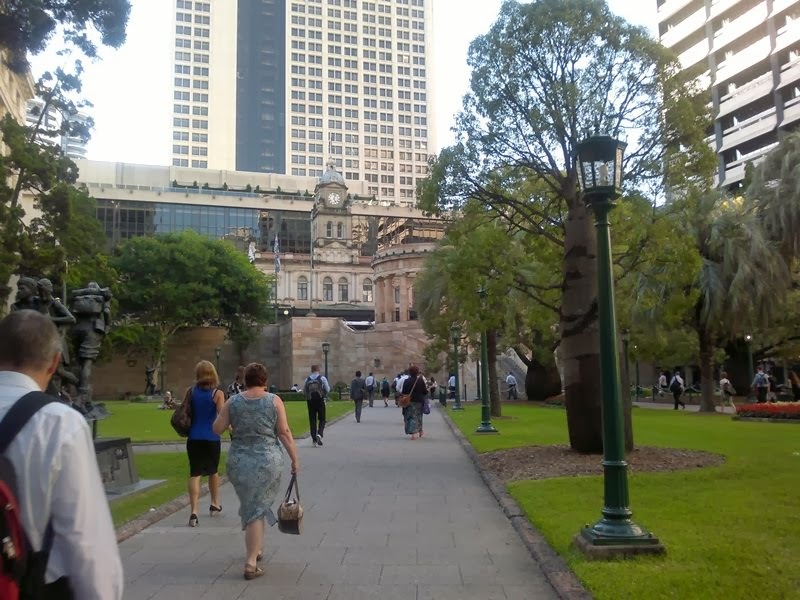 Meant I had some time to kill back in the city (waited until my mum finished work to catch the train home with her). I looked at OPI polishes in David Jones, and sunglasses (lusting after a Prada pair), and handbags (lusting after anything with a 4 figure price tag). Then I wandered some cheaper clothes shops and tried on shoes in Peeptoe. I have a pair that is selling well on ebay (yay me) which I think is an excuse to treat myself with a new pair that fits. Anyway, this is all I actually bought. Three Ultra3 nailpolishes at $2 each, I have read that they are good on a few of the nail polish blogs I follow and knew I had seen them at the chemist before (think I have owned some in the past) and knew they were cheap. But I spent more than that on today's lunch! (being away from SJ's leftovers and all). I have 'Black Satin' (because I don't own a plain black polish), Gold Rush Fever (because I had intended to paint my nails before the bloggers meet, and gold is the colour of my shoes...) and Sizzling Red (because you can never have too many reds). If you're lucky, I will do some swatches over the next week...I might even go back and buy a few more to giveaway next week...would that be a good idea? Oh and I signed up for the Michelle Bridges 12 Week Body Transformation today, it starts Monday. Haven't performed any pre-season activities yet though so I shall blog about it later. If any of my followers are participating, please let me know. Some beautiful photos! Especially the sunrise and frangipanis! I still don't own a gold nail polish..that ulta3 one looks gorgeous, may have to see if I can hunt one down! Aw those flowers are so purdy! I am. I found the biggest help in the pre seasons= tasks last round was clearing out the pantry/fridge. I havent done that yet though . Yay for ulta 3's :D. I love sizzling red as its a perfect red.